Study Primate Biology, Behaviour and Management. Primates evolved from small arboreal (tree dwellers) ancestors. The fact that most primates remained in trees as the many species evolved is thought to have kept them from danger. Trees offer protection from predators; and also trees provide a reliable source of food (vegetation, insects, etc). Primates that are ground dwelling now are big sized species or man. In order to stop them from falling, arboreal primates evolved hands, rather than claws as in other arboreal animals, that can grasp branches firmly. This adaptation had a secondary value, allowing primates the ability to hold and manipulate objects more precisely than other animals. With more useable hands, primates were better able to jump from branch to branch. To jump more effectively, primates would then need better eyesight; a better sense of touch; and greater intelligence to make faster decisions as they moved through the trees. There are approximately 200 - 240 species of primates able to live in a variety of different habitats and climates (tropical rainforests to semi desert areas to cold and snowy), with some spending most of their lives around trees, while others can spend most of their times on the ground. Conservation in the wild -of individual breeds? To understand the taxonomy, biology and management of primate animals both in captivity and the wild. Discuss the nature and scope of our knowledge of primate animals. Describe a variety of different species from the suborder Strepsirhini. Describe a variety of different species from the suborder Haplorhini. Explain the dietary requirements for different primates. Explain the management of the physical wellbeing of primates. Explain the psychology of primates and their natural behaviour. Explain the management of the psychological wellbeing of primates in captivity. Explain breeding programmes for managing the conservation of primates. Explain the conservation of a range of primates. Explain the management of primates in captivity. One male and several females - in situations where there is one male and several females in a group, this is known as a polygynous mating pattern. This is where one male regularly lives with and mates with more than one female at a time. It is not considered to be a promiscuous mating pattern, but that the male and his female mates have a distinct child rearing and mating group. This pattern is found in some human societies (but it is not as common in humans as monogamy). In non-human primates, examples are found in geladas, langurs, howler monkeys, gorillas, and hamadryas baboons. The 'one male to several females' type groups are not necessarily dominated by the males. For example, in geladas, the female is usually in control of the social group, even though the males tend to be larger, more aggressive and stronger. Female relatives, such as aunts, sisters and mothers will form a team to chase off unrelated females. The females form the stable core of the community, and their relationships with the male are typically short term. The females also select a mutual mate from the potential suitors who come into their territory. The male will usually be chosen if he is willing to cooperate to defend the territory and does not act abusively towards them. Occasionally one male to several females groups can take a different form when there is pressure from predators. For example, hamadryas baboons live in open grasslands. They may form larger communities of several polygynous families. In this grouping, the males are usually the dominant, controlling members. The adult males will protect the community from predators, maintain order, and “herd” their own sexually mature females. Multimale - multi female group - on the other hand, gorillas do not often have to be concerned about predator danger, so their communities usually consist of a single dominant male, several female mates, and their offspring. When the young male offspring reach maturity, the dominant silverback male will usually drive them off. These males will then form their own male-several female groups. When the female offspring reach sexual maturity, they will leave the natal group. They will join with single males and form their own families or join families of males who have mates already. If there are several silverback males with peaceful personalities, the community may have several males. Single female and her young offspring - this is a rare pattern for primates, but it is common for other mammals. The single female and their offspring live together. This grouping is found in some small nocturnal prosimians, such as galagos and mouse lemurs, as well as orang-utans. The adult males live mostly alone, but come to the females occasionally for mating. The males will usually have large territories that overlap the territories of several females. Male and female offspring will usually leave the mother when they become sexually mature. The mother, though, is the most influential in socialising her offspring. 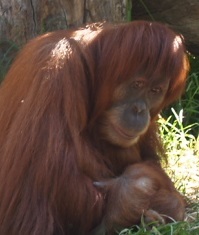 The mother can have an influence on the identity of the offspring’s peers and also sometimes the rank of their offspring. Monogamous family group - this grouping usually consists of the adult male and female with their children. It is also known as a 'nuclear family' in humans. When the offspring reach sexual maturity, they will leave to form their own nuclear family. This grouping is common in humans, but rare in non-human primates. It has been found in some New World monkeys, prosimians and small Asian apes. It is particularly common in titi monkeys, indris, tarsiers and gibbons. Polyandrous family group - this grouping usually starts with a monogamous mating pair. Then a second male will join and then potentially mate with the female and help with child rearing. This is practical because monkeys that form polyandrous groups commonly have twins. The fathers are then able to carry the babies around on their backs most of the time. This is extremely rare in non-human primates, but does occur in the smallest New World monkeys, tamarins and marmosets. Fission-fusion group - primates often live in a social grouping pattern known as a fission-fusion social group. This group is a pattern where individuals form temporary small parties or subgroups, whilst still being a stable member of a larger community (the unit-group). Subgroups, however, will have regular contact with the unit-group. The main form of sub-group will be a mother and her young offspring. In primates, there is often a fluid movement between the subgroups and unit-groups. This leads to the size and composition of the group changing frequently. But most non-human groups tend to have little contact with other social groups, particularly the females of the group. Primates tend to remain within their home territory and in their own locale. This aloofness from other groups is used to protect the resources (generally available food at that time of the year) from rapid depletion. Sometimes, communities are aggressive to each other. Chimpanzees are an exception to this. When two groups of primates meet, they tend to spend a few hours in happy, exciting play. Sometimes, females will change groups. It is thought they do this as a way to find a mate and expand the gene pool within the group. Occasionally, the meeting of two chimpanzee groups can result in genocidal violence. Some forest dwelling primates, such as indris, gibbons, howler monkeys and siamangs, will remain in their own territory but will go close to the border between their own territory and the territory of another primate community. These four species tend to live in small home ranges, so the food resources belonging to the neighbouring community can be seen and will appear attractive. They will make hostile displays towards each other. They will produce loud vocalisations to intimidate the other community. A veterinary or animal science professional. You can enrol on Primates today. If you have any questions or want to know more about the courses, then get in touch with our specialist Wildlife tutors - call us on (UK) 01384 442752 or (International) +44 (0) 1384 442752, or use our FREE COURSE COUNSELLING SERVICE. Click any icon for more information. Dr Robert BrowneZoologist, Environmental Scientist and Sustainability, science based consultancy with biotechnology corporations. Work focused on conservation and sustainability. Robert has published work in the fields of nutrition, pathology, larval growth and development, husbandry, thermo-biology, reproduction technologies, and facility design.Robert has B.Sc., Ph, D.
Marius Erasmus Subsequent to completing a BSc (Agric) degree in animal science, Marius completed an honours degree in wildlife management, and a masters degree in production animal physiology. Following the Masters degree, he has worked for 9 years in the UK, and South Africa in wildlife management, dairy, beef and poultry farming. Animal PsychologyComparative Animal Psychology. This is an excellent reference for anyone interested in understanding animals better; students, animal owners and anyone who works with animals. Animal HealthA book for anyone interested in animal health, from pet owners to farmers. Contents cover understanding health issues, disease and injury prevention, inspecting animals, differential diagnosis and common illnesses. Animals can suffer from injury, poisoning, hereditary conditions, nutritional problems and viral, bacterial and fungal infections. 77 pages. Human BiologyFor any new student of human biology, being confronted with thousands of unfamiliar words can be overwhelming. It can also be difficult to identify which words you need to learn first. This book presents words that have been carefully selected as the most important for new biology students to learn and understand. It also provides more information about each word than is often found in traditional dictionaries, giving students a more in-depth understanding of the word's meaning. The book is intended as an aid to all new students of human biology.